I had the privilege of meeting Stacy & Charles while setting up for a wedding in this gorgeous space. They happened to be doing a walk through of the venue and I had a moment to speak to them. A week later Stacy contacted me and from then on we began planning this beautiful wedding. Stacy is from California and Charles is a local so throughout the year I had the opportunity to meet with them for planning. Every time I met with them they were so sweet and both had a twinkle in their eyes at each other. Charles always had the perfect answer to his bride… “Whatever you want, dear”. The day began with hair and makeup by Concierge Makeup. The ceremony and reception took place in the Havana Room at the Tropicana Las Vegas. The beautiful flowers were created by the ever so talented Naakiti floral who brought all of Stacy’s visions to life. Stacy provided the vases so all of her local guests had an extra take away from the wedding. The ceremony was officiated by Stacy’s Stepfather which put the perfect personal touch into the wedding. During the ceremony since Stacy was not only gaining a husband but also a son, they did a sand ceremony to unite the three of them. Catering and the exquisite wedding cake was provided by the Tropicana, including the exquisite groom’s cake of a camera (everything edible- see awesome photo below). Charles is a videographer/videographer and with his surprise there wasn’t a cutting of that cake as he wanted to keep it forever. The menu consisted of a three course plated dinner featuring: Lobster Bisque, chipotle caesar salad, guests choice of herb grilled chicken breast or roasted organic salmon. During cocktail hour the bride and groom’s favorite food chicken wings were served. The Chef custom made the wings of their favorites: Buffalo Hot, Salt & Vinegar, Lemon Pepper, and Teriyaki. Also during cocktail hour they had a violinist, Tony B performed. The signature cocktail chosen by them is their favorite drink of Kentucky Mules. All of the photography in this blog and from their wedding day was shot by Indigo Foto. They also had cinema created by K+A Creative. The final personalized touch were their adorable wedding favors of maple syrup. The story behind it being they are each other’s perfect match because one only likes the outside of a pancake and the other only eats the inside so together they have a whole pancake (with maple syrup of course). Stacy & Charles, I could not thank you enough for having us as part of your perfect wedding day. I look forward to seeing your future together! I have never met a bride more organized and ready to go then when I met Marissa eight months prior to their wedding. She knew exactly what she wanted and how she wanted it. When she said she needed a wedding planner, it was the first time I thought are you sure you need one? (Kidding) Joking aside, Marissa and Nate were such an adorable couple. They each complimented each other so perfectly. Coming from the midwest, the rivalries between in state schools are very serious but in the end, they put their differences aside for love. You see, Marissa went to Oklahoma, and Nate went to Oklahoma State. Being the amazing bride Marissa was though she called me for a top secret surprise that only me and the person coming would know. She decided to surprise Nate with Pistal Pete (Oklahoma State’s mascot). It was quite the journey coming here as he couldn’t fly because of the size of his head so he had to drive from Oklahoma State to Las Vegas. This could not have been a better surprise. Nate and his groomsmen looked like a child seeing Santa. It was such a memorable moment. The wedding was absolutely gorgeous from start to finish as I knew it would be. Thank you so much Marissa and Nate for choosing us to be part of your wedding day! As everyone knows and says, planning a wedding can be extremely stressful. Something that only adds to the stress is last minute things that come up in which the couple either overlooks or since they haven’t been married doesn’t even know they need. My suggestion to anyone getting married of course is to hire a wedding planner or at very least a day of coordinator to prevent any stress from happening. However, if this is not in your budget please feel free to read on for the little things couples usually forget. 1. The Rings- now of course this is something that is purchased far in advance but the day of your wedding this is one of the most forgetful items. I don’t know if it’s the excitement of the whole thing or what but this happens often. Try to assign someone the week of your wedding to be in charge of both wedding rings this way they will show up and be together. 2. Accessories- Sure the tux and dress arrive safely but what about the little things. The ties, socks, veil, earrings, garter, shoes, everything that puts your entire outfit together. Three quick stories I have on this is one, our wedding I packed both of our outfits from head to toe, with extra accessories in case I didn’t like something. Come the next afternoon as my future hubby is getting dressed he calls my maid of honor to ask where the tie was. Of course I left it at home. The only thing that is definitely going to stand out if he didn’t have. Luckily for us, we lived 2 minutes away and best man came to the rescue. A wedding I planned, thank goodness the bride woke up with butterflies at 5 am because as she was laying out her accessories for the photographers she realized her veil was at her sister’s house in Houston, Texas (we were in Vegas). Luckily a friend didn’t have his flight until a few hours later and was able to get the veil in time for his flight and have it well before the wedding started. On a side note, by hiring us I would have ran to the store myself and found the exact veil or one closest to it for her. Last one of my grooms forgot a pair of socks for the big day. Since he was closest to Crystals he went over only to buy a $45 pair of designer socks… that ended up being close to knee highs on him. It was hilarious and I can only imagine his brides face that night when she saw them. I send out a checklist of things to remember but it is always best to designate a trustworthy bridal party or family member to keep this stuff safe. 3. Unity Ceremony items- whether they be custom traditions for your culture or something fun to add into the ceremony, don’t forget these items. Most are purchased by the couple and this is a reason I strongly agree to having a wedding coordinator because you can make them responsible for these items. You don’t want your officiant to call you up for the sand ceremony and have vases but no sand to unite with. 4. Place cards- If you are having a sit down dinner where guests choose what they are having you MUST have place cards. I have yet to find a venue that doesn’t require them. Each guest receives a place card and there is always a “secret” symbol on them to designate who has fish, beef, or chicken. A classy way of doing this is by simply adding a different color pearl or rhinestone for each (i.e. fish-white, beef-black, chicken-wedding color) You can always have place cards if you don’t have your guests choose but couples you must have them if they do. If you have a buffet or family style then you may opt out for the extra work in place cards and just do a poster seating chart. Many places also do not set these up for you, so if you want your family and friends to relax on your wedding day this is also a good reason to hire a wedding coordinator. 5. Table Numbers- You rented all your centerpieces, linen, etc, but what about your table numbers? Some rental companies offer table numbers as well but couples tend to forget until the very last minute (just like the place cards) that these are needed. If you have assigned seating then you definitely need either table numbers, books, however you decide your guests will find their seats make sure you actually show this within the centerpieces. 6. Guestbook- Something else you need to bring yourself and set up (or have your wedding coordinator which yes many venues give you a coordinator but they are mostly for the ceremony and many will not set up additional items for you). Guestbooks are all sorts of items from a traditional book, photo book, monogram letter, anything to be unique and stand out. You don’t want to forget this because although guests RSVP to your weddings, you want to know who actually showed up. Don’t forget if you choose something unique to make sure you have a pen that writes well on it. 7. Card box- If you are allowing guest to bring gifts to your wedding then you must have a spot for them to put it. Most guests typically bring cards and there are tons of cute ways to display a card box. Find something that fits the theme of your wedding. Some rental companies offer a few standard boxes but go unique and you can keep it as home decor after. This also needs to be set up by you. 8. Any additional decor items- In the Pinterest world we live in today, it is typical for couples to find all these little add ons to decor that they want to buy instead of rent. This is a great addition to your wedding decorations, typically cost effective, and looks great. However, any of these items will also need someone to set up. As a wedding planner I will be honest to say there hasn’t been a wedding yet that I have planned that the bed of our truck wasn’t filled with extra things the couple had for their wedding. I am not saying all planners are open to sharing their spare room with items you mail to them but I am very considerate of out of town guests and I don’t mind having items sent to the house. I love helping set up the room and making it just as you wish. It is very important to keep these things always in the back of your mind throughout the planning process. 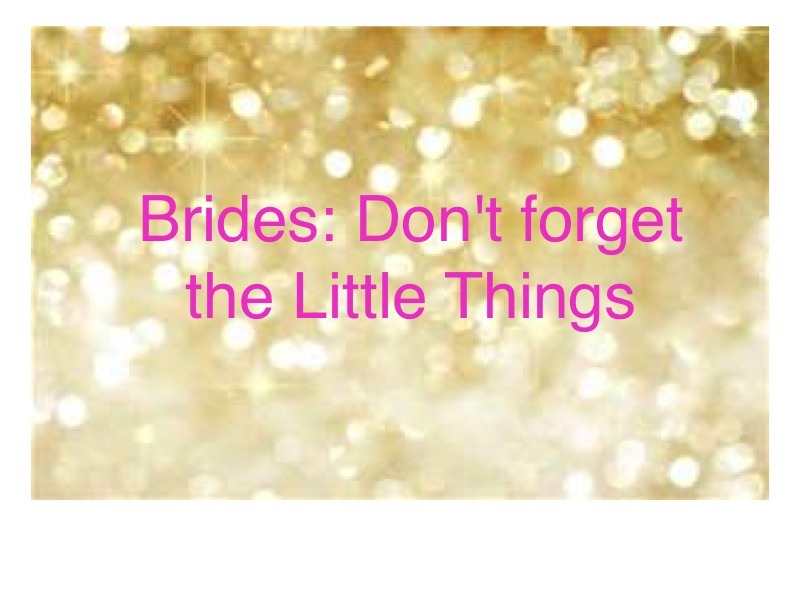 Keep notes on everything you buy for your wedding and what you need to bring so you don’t forget. Create your own checklist with these items and I would even assign someone you trust to keep them all together. I know I am a wedding planner but even if I wasn’t, I highly suggest hiring a day of coordinator to put everything together. Many of the venues you use have coordinators, however, their job doesn’t include setting up your place cards, DIY decor, and table numbers. It is best to hire someone so that you do not have to have your family members or bridal party set up before the ceremony. I have had lots of requests for day of coordination lately but I think many couples are confused at what this entails. We can’t come right before the ceremony and leave after your first dance (at least I do not). We are there hours before setting up the space, making sure all your vendors know what they are doing and arrive on time. We set up all your DIY stuff and extra decor. We have to be in contact with you and your vendors at least a month prior to make sure everyone is on the same page. You can hire a coordinator that may only show up for your ceremony but why even hire them. Research exactly what you are getting before you book anyone, including all vendors and venues. There are tons of people out there who give great breaks on pricing but just remember, you get what you pay for. Desirable Events by Desi goes above and beyond expectations because we want you book many more events with us. Engaged or planning an event? Please contact me at desi@desirableevent.com or (248)836-8605 for more information. I also would love to meet in person or through Skype for a free consultation.